I LOVE Halloween! When I see Halloween candy and decorations in the store, I am as excited as a kid on Christmas morning. In September, I start looking for Halloween theme events around the city. I wanted to share some of the gems I found. 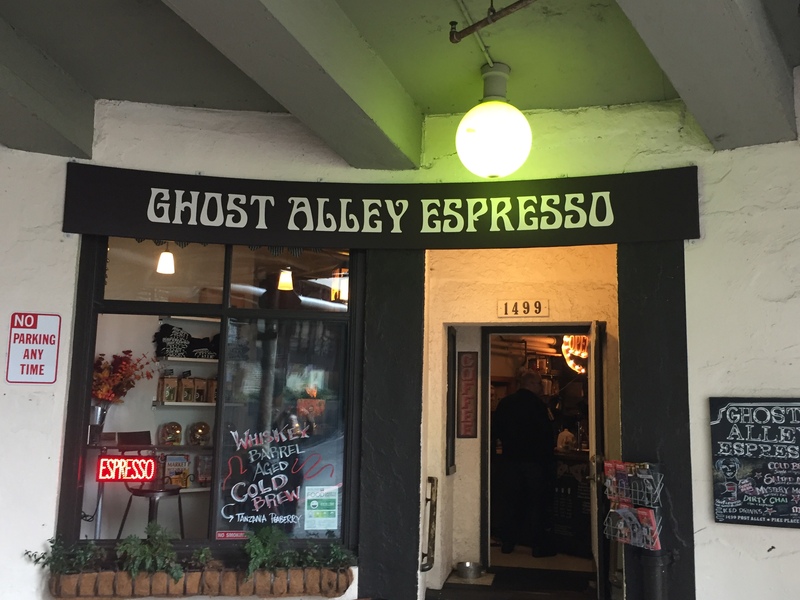 If you need some spooky refreshments, I would suggest heading down to Ghost Alley Espresso at Pike Place Market. 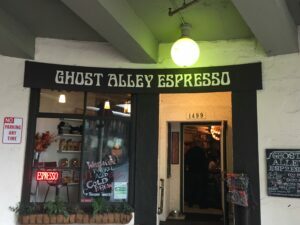 This haunted café is in a little alley right before the gum wall. If you are lucky maybe you will see the ghost of Arthur Goodwin. 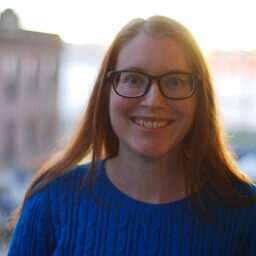 Goodwin was one of the instrumental people in creating Pike Place Market. If you can’t see Goodwin then you will see a resident ghost who greets customers. I was happy to see the Halloween themed drinks on the menu. If you are brave, try the Mystery Mocha. Only the barista knows what ingredients are in this mocha. My chai tea latte needed a bit of Halloween joy so the owner created a Jack O’Lantern design for me using the foam. 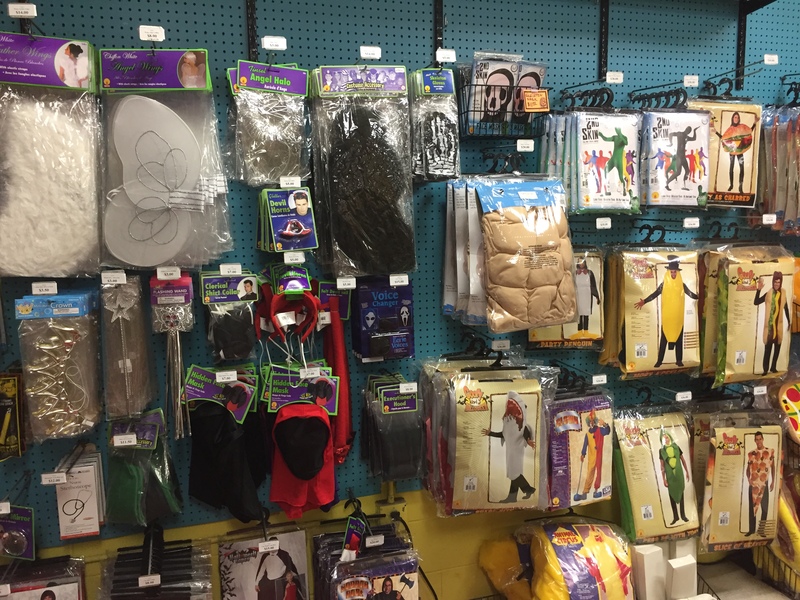 Looking for a costume or some spooky accessories, Archie McPhee is a great place to go for children and adults. Filled with funny Knick Knacks and costumes, it was fun to go in and explore. While you are shopping you might be able to see the Wallingford Beast. The beast was described in 1934 as being insect like with the head of a chimpanzee and then in 2010, Archie McPhee’s employees reported sightings. 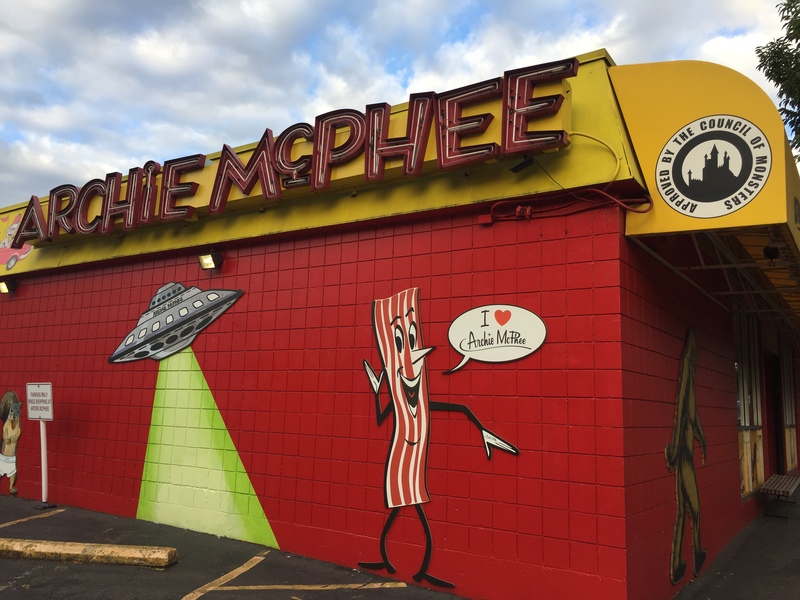 I am not sure what I am going to be yet for Halloween but when I do figure it out, I will be returning to Archie McPhee to get my costume and accessories. The Woodland Park Zoo hosts the Pumpkin Bash on Saturday, October 28th and Sunday, October 29th. 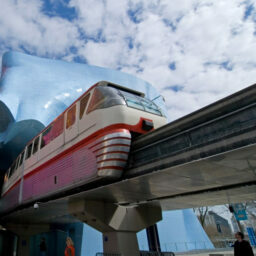 This whole day event includes many fun events for the family and the zoo animals. 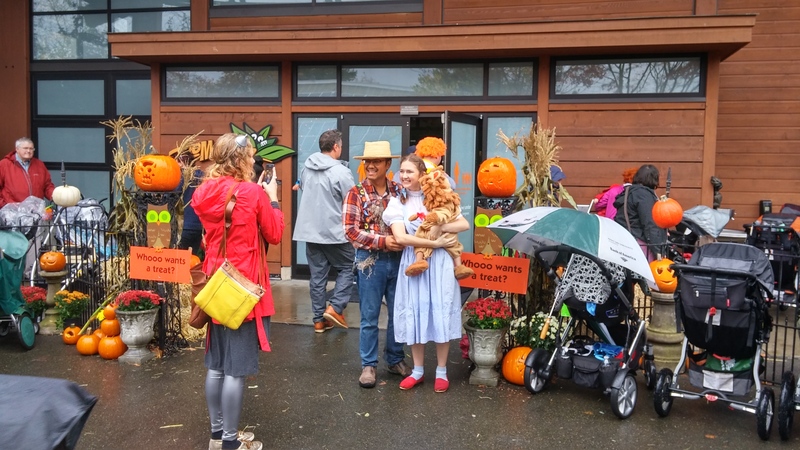 Children can go trick or treating around the zoo. Children get to become a mad scientist with fun interactive science activities. This event includes the Boomazium, a fun Halloween themed house that includes not very scary storytelling and puppet shows. Just in case, anyone needs extra cuteness, the animals have pumpkins to play with. 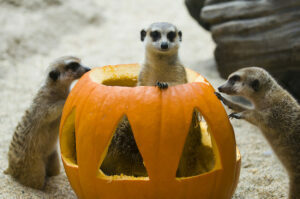 A meerkat playing inside a pumpkin deserves an “awwww”. Rain or shine, this will be a fun event! Children and adults show off their costumes at Woodland Park Zoo Courtesy of Woodland Park Zoo. 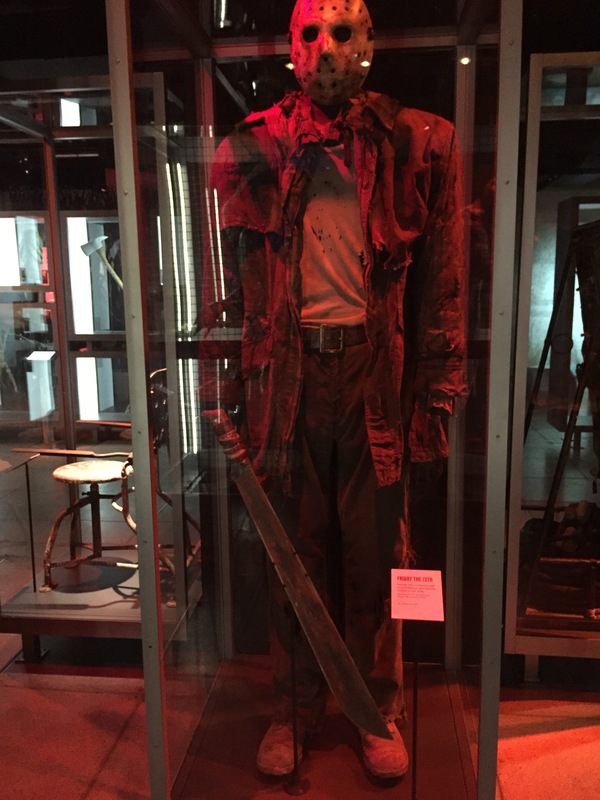 For young adults (ages 13 and up) and adults, MoPOP’s newest exhibit, Scared to Death: The Thrill of Horror Film, is a great spooky activity. Scared to Death takes an in depth looks at more than a century of horror cinema. MoPOP has created separate areas in the exhibit to showcase vampires, zombies and slashers. 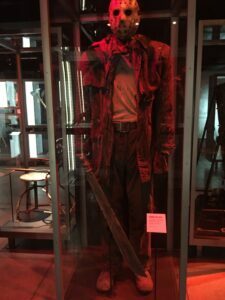 This exhibit houses more than 50 original props from movies such as Nightmare on Elm Street, The Walking Dead, Friday the 13th and one of my personal favorites, Buffy the Vampire Slayer. As I was walking around the exhibit, I was able to geek out about all my favorite scary movies. One of my favorite parts was a wall full of the history of the different types of villains and why people fear them. In the exhibit, horror writers and directors like Eli Roth and John Landis talked about their famous films. If you are brave, take a turn in the scream booth or a photo op in a coffin. Along with the exhibit is the Campout Cinema where people are able to watch movies like the Dark Crystal and Nightmare on Elm Street 3 at MoPOP. Another fun event offered at MoPOP in October is Cheryl Henson; daughter of famous Jim Henson will be discussing her parents’ legacy. And for those over 21, check out the After Dark Happy Hour. Seattle is a busy city and there many Halloween events to choose from so please comment below, with any other Halloween related events happening in the city. I wish you all a very Happy Halloween! People from around the world will all be doing dancing to Michael Jackson’s Thriller at the same time. And, yes, “awwww” for Meerkats -darling.